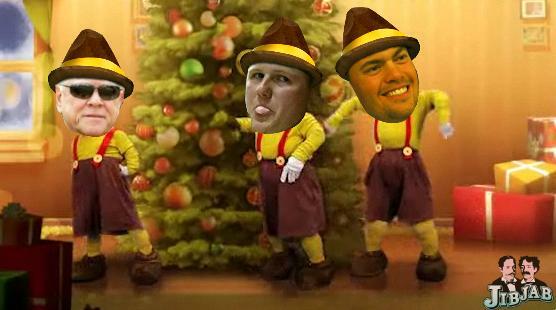 Click the image to see Walt Jocketty and the two new guys he just signed do a lovely Christmas dance for your enjoyment. It takes a minute to load, but it’s worth it. Happy holidays, Reds fans everywhere! Comments Off on Merry Christmas, Reds fans! Today, the Cincinnati Reds confirmed what the rest of the baseball world knew days ago: they’d traded for reliever Sean Marshall from the Chicago Cubs. CINCINNATI – Cincinnati Reds President of Baseball Operations and General Manager Walt Jocketty today announced the acquisition of LHP Sean Marshall from the Chicago Cubs in exchange for LHP Travis Wood, OF Dave Sappelt and minor league IF Ronald Torreyes. Marshall, 29, last season for the Cubs posted a 2.26 ERA and 5 saves in 78 relief appearances, tied for fifth-most in the Major Leagues. He established a single-season franchise record with 34 holds while holding opponents scoreless in 65 of his 78 games. Also in 2011, Marshall allowed just 1 home run in 75.2 innings, the fourth-best ratio among all Major League relievers. His 0.89 ERA in his final 33 appearances of the season was the second-best in the majors over that span to Jose Valverde’s 0.88 ERA. Marshall’s 4.65 strikeouts-per-walks ratio led all relievers who threw at least 75.0 innings. Over the last 2 seasons, Marshall ranks second among all Major League pitchers with 158 appearances. Among among all big league relievers the last 2 years, he ranks second with a 2.45 ERA and fifth with 150.1 innings pitched and 169 strikeouts. Marshall has posted a sterling 2.67 ERA in 233 career relief appearances. Last season Wood went 6-6 with a 4.84 ERA in 18 starts and 4 relief appearances for the Reds and 2-3 with a 5.33 ERA in 10 starts for Class AAA Louisville. Sappelt spent most of the season with the Bats but hit .243 in 38 appearances for the Reds. Torreyes hit .356 in 67 games for Class A Dayton. So the Reds now have a seriously useful piece in their 2012 bullpen. The price was steep, but there can be no doubt that the team is serious about contending next year. Posted in Chicago Cubs, Cincinnati Reds, NL Central, Wheeling and Dealing. Yardbarker is reporting a rumor that the Reds are in discussions with the Cubs to trade LHP Travis Wood for LHP Sean Marshall. Marshall, 29, has been one of the game’s top left-handed relievers the past two seasons. He will earn $3.1 million in 2012, then become eligible for free agency. Wood, 24, endured two minor league demotions last season, finishing 6-6 with a 4.84 ERA in 22 games, including 18 starts, with the Reds. He is expendable in part because of the Reds’ recent acquisition of Mat Latos from the Padres. It’s not exciting news on the level of the last trade, but it’s nice just hear Cincinnati mentioned in the conversations for a change. Posted in Chicago Cubs, Cincinnati Reds, Travis Wood, Wheeling and Dealing. The Reds are reporting that they have completed a five-player trade with the San Diego Padres to send RHP Edinson Volquez, RHP Brad Boxberger, infielder Yonder Alonso, and catcher Yasmani Grandal to the sunshine state in exchange for RHP Mat Latos. It would have cost the Reds another top-10 prospect to get Mat’s other T, so they decided they could do without it. The 24-year-old Latos went 9-14 with a 3.47 ERA and .233 average against in 31 starts this past season in San Diego. In 2010, his first full season in the Majors, he set a modern Major League record by allowing two-runs-or-fewer in 15 straight starts of five-or-more innings pitched, according to the Elias Sports Bureau. I’ll also add that his ground ball to fly ball ratio was 0.76 last year. Clearly we’ll see how it goes as more information emerges and as the season plays out, but for the moment, I’m saying it’s more exciting thing to happen in Reds fandom since June. I can hardly wait to see what happens next. 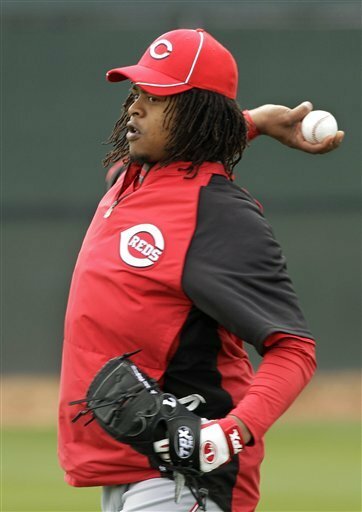 Posted in Cincinnati Reds, Edinson Volquez, Wheeling and Dealing. Congratulations, Asdrubal. Here’s your Gibby. MLB announced the winners of the Gibbys tonight at 9 p.m. on the MLB network and on their website. In the disaster of tabbing and scrolling that was the nominations, I only saw Brandon Phillips from the Reds, in the category of Best Defensive Player. Google was able to tell me that Phillips did not win this honor this year, thankfully without me having to sit through the actual program. Comments Off on Congratulations, Asdrubal. Here’s your Gibby.